All the way from Australia I managed to get some AN10 breather pipe fittings for the rocker covers. They are sized to be a tight fit and have been told that a rubber mallet is the way to go (for banging in purposes!). 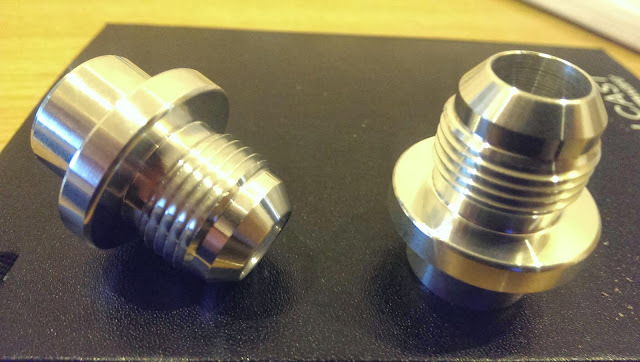 The pair were reassuringly expensive but are machined items of a high quality. Note that it's important to get the right size for your particular make of engine (duh!) As an RB25 takes a smaller diameter to that of an RB26. Will post my success (or otherwise) after I get the covers back from paint. These are very easy to fit, and once fitted will provide a tight seal and not leak any oil at all.